Equating today’s consumer internet to enterprise IT (B2B/B2E) is similar to comparing cheese to chalk. The consumer internet is awash with social media and mobile apps delivered from the cloud. Its ingredients are primarily unstructured data, free-form collaboration through conversational messaging and page sharing, and dynamic intelligence based on sentimental and behavioral analytics. It resembles cheese that is flavorful and melts to the customer’s taste. Enterprise Apps on the other hand remain stuck in the past. Core business still relies on old infrastructure ranging from mainframes to centralized data warehouses. Its ingredients are predominantly structured transactions, statically-typed interfaces and point-to-point messaging. They resemble chalk, rigid and inelastic to changes in the business environment. Enterprise data are primarily structured and are usually stored in relational DBMS with some unstructured documents stored in distributed file systems. Enterprise processes rely on a robust auditable transactional model executed through prescriptive orchestration of back-end services. Enterprise user interfaces focus on repetitive interactions through creation/update/deletion of business records. Until recently, Enterprise used to have at least one advantage – “Business Intelligence”. At a tremendous cost in data marts and warehouses it could deliver a strategic picture of what had occurred and carried the ability to slice and dice it to help plan future business strategy. But the consumer internet is beating even that edge now. And handily at that. Social Analytics can deliver “what is happening now” along with predictive insight to make better decisions on case by case basis. 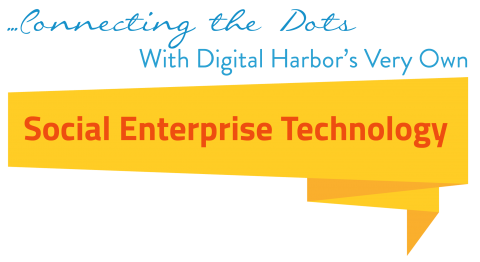 What if Enterprise Applications became socially aware? Applications could then have conversations with knowledge workers to help them make decisions. Users could chat about their data within their data. Their notes and observations can be ontologically linked to people, places and things within and outside the context of business. These chats and observations could in turn enrich structured transactional data with enhanced social intelligence. Users could change the workflow in real-time to adapt to the context of the situation or transaction. They could even share any portion of their data or app with others through just-in-time security. And Users could talk to their Apps just like they can to their smartphone. That’s what Social Enterprise Technology (SET) is all about. An indigenous next-gen technology platform from Digital Harbor, SET aims to transform enterprises from focusing on “better transactions” to “better decisions”. SET will be as disruptive to the enterprise as smart phones were to cell phones or personal computers to mainframe. SET is arriving soon. Web 3.0 will be finally here. What’s ‘social’ about Social Enterprise Technology? With over 18 years of expertise in providing Compliance and Intelligent Risk Management solutions, agnostic of industry, Digital Harbor has transformed the way knowledge workers respond to real-time data variations in complex business processes. Innovating healthcare operations under the flagship of “Know Your Risk” suite, Digital Harbor is now a trusted partner of leading Healthcare organizations across the United States.